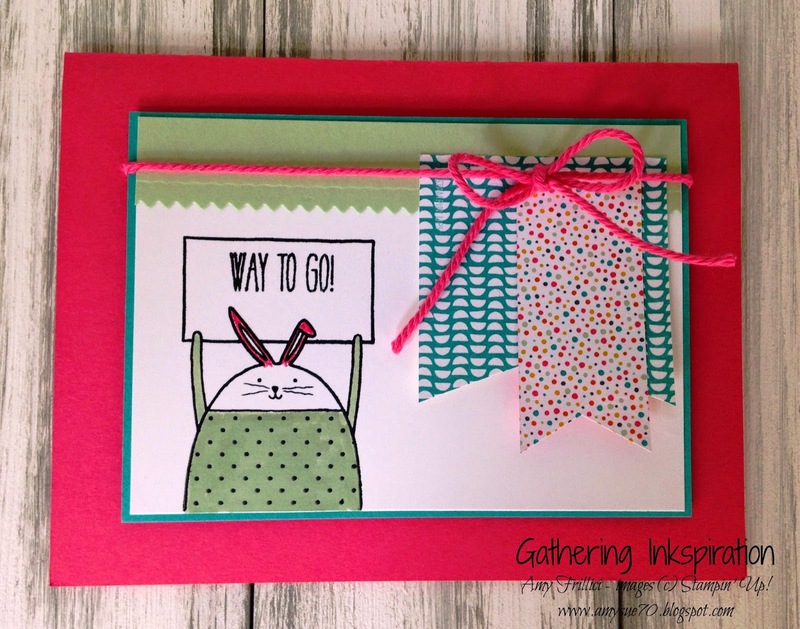 Gathering Inkspiration: Cheerful Critters.... Way to Go! Oh, my gosh!! This little guy (or maybe it's a girl??) is so cute!! I just love him (her??)!! It's a simple card, suitable for any occasion where you feel like saying "congratulations" or "way to go!" Now that I think about it, this would make a great graduation card!! We start our card with a Strawberry Slush card base. Don't forget that ALL of the 2013-15 In Colors - Pistachio Pudding, Baked Brown Sugar, Coastal Cabana, Crisp Cantalope and Strawberry Slush will be retiring very soon!! I am going to miss all of these colors so much!! Make sure you stock up now (on paper, ink pads, ink refills and thick baker's twine) in these fabulous colors before they are gone forever!! Don't wait until the retiring lists come out in a few weeks, because it's usually too late by then. To shop now, just click here! Next, we added a layer of Bermuda Bay card stock, followed by a layer of Whisper White card stock. We added that "fringed" Pistachio Pudding strip (courtesy of our Finishing Touches Edgelits) to the top of this piece. Make sure to add this piece before you stamp the bunny, so that you have enough room for him - he can always be a bit shorter if you need him to be! That cute bunny, along with the sentiment "Way To Go!" can be found in the super-cute Cheerful Critters Stamp Set. We colored our bunny in with our Strawberry Slush and Pistachio Pudding Stampin' Write Markers. If you love this stamp set as much as I do, you might like to join us at the Cheerful Critters Class on April 30 - more details on this class can be found here. We added a couple of strips of the Confetti Celebration Designer Series Paper (one of my favorite DSPs - I just love the color combinations!) and flag the ends to look like banners. Finally, we tied a Strawberry Slush Thick Baker's Twine bow around this piece and then added it to our card base. I hope you like this card as much as I do! !